Spearing Service L.P. is a Canadian company providing 24 hour oilfield services related to trucking and production of oil, natural gas and liquids. We are one of many subsidiary business units of the Mullen Group Ltd.
Spearing uses modern specifically designed trucks and trailers as well as highly trained personnel to safely and efficiently service our customers. At the present time we are operating over 225 units and lease operators from several locations in southeast Saskatchewan and southwest Manitoba with 250 employees. 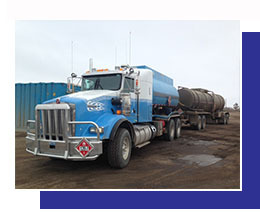 Spearing’s fleet includes sour sealed trucks and tankers, hot oilers, combo vacs, steamers, frac tanks, super heaters, fresh water trailers and winch tractors. Additional construction services include sand and gravel sales, contaminate hauling and excavation equipment. Spearing is very active in cross border crude oil transportation, both into the US and into Canada. We are familiar and in compliance with all regulations and legislation to provide this service. Operating authorities are held in Saskatchewan, Manitoba, Alberta, North Dakota and Montana. Spearing considers our safety culture a fundamental requirement to meeting our objectives including satisfied customers and better business results.